Big grin endears big Jim Arness +o "Gunsmoke's" 40 million fans. Arness's 6'7" 235 pound frame dwarfs fair sized Utah buck, makes Remington M275 .280 look like child's toy. THE BIG BOOM DAYS of TV Westerns began about four years ago, and each succeeding season finds more of the "hay eaters" galloping across the screens of our living room monsters. Just a few short weeks ago, eight of the ten top shows on TV, measured in viewer popularity, were Westerns. And well out in front of even that fast-running pack was "Gunsmoke"—that least spectacular of the non-spectaculars, in which four relatively unremarkable people in a relatively unremarkable setting drawl homespun speech into story patterns that are homespun too. Highbrows pretend disdain for the horse operas, and gun addicts have long loved to pick flaws with gun history and gun use as portrayed on movie and TV screens. But "Gun-smoke" manages to survive these critics by entertaining 40,000,000 viewers each week; and few of these find much to criticize in "Gunsmoke's" gun techniques. 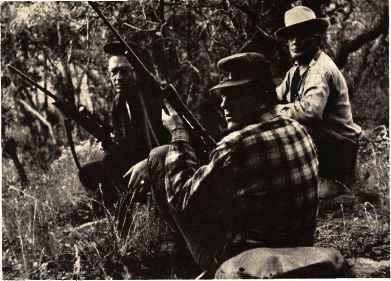 "Gunsmoke" folks do reload between gun-fulls, don't drop six redskins with one shot, are gun addicts themselves for more than business reasons. 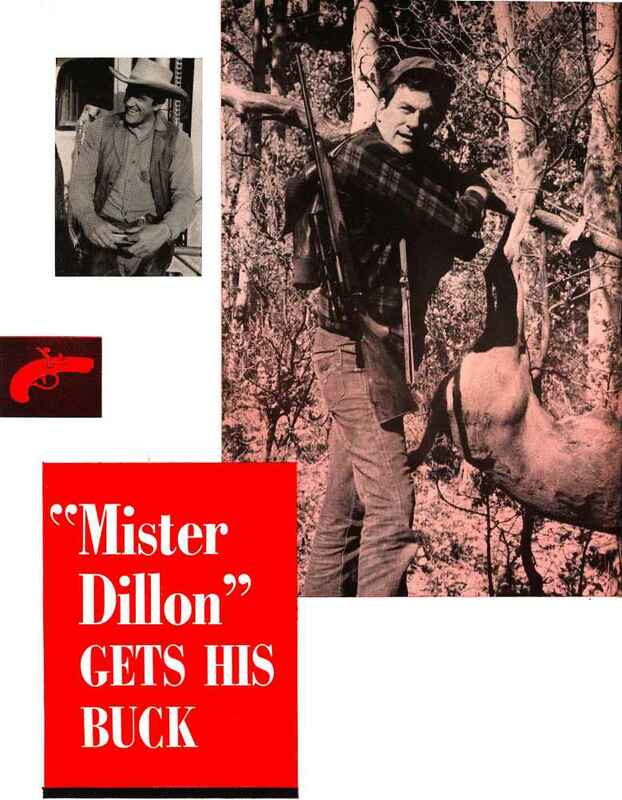 "Gunsmoke's" Marshal Matt Dillon, Jim Arness, is just about the biggest thing ever stuffed into Levi pants and high-heeled boots. He is 6 feet 7 inches tall, weighs 235. Add cowboy heels and eight or more inches of high-crowned Stetson and you've got a lot of U. S. Marshal, even without guns. But Arness prefers not to be without them, on set or off. He makes no claim to being "The Fastest Gun Alive"—"Gunsmoke" is one of the few Westerns in which the hero can miss, can even be out-drawn; but he has worked hard under the best fast-draw teachers to attain the considerable speed he has, and he is the proud owner-user of several much prized sporting guns (of which more later). The other full-time stars of "Gunsmoke" are Chester Goode (played by Dennis Weaver), Doc Adams (played by Milburn Stone), and Kitty Russell (played by Amanda Blake). 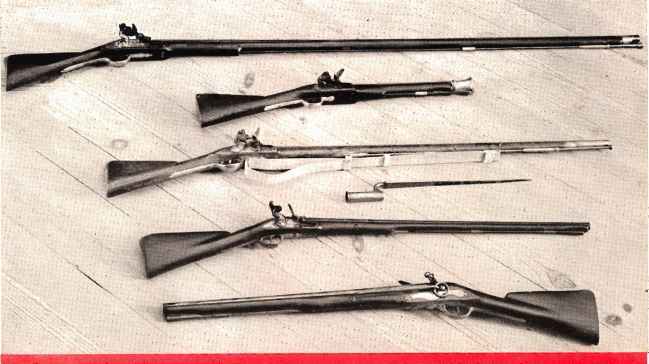 Of these, at least two are also gun enthusiasts, and the third ("Miss Kitty") is an eager novice. mountain game Balvar 8 scope. the year, leaves little time for sport shooting or any other form of recreation. 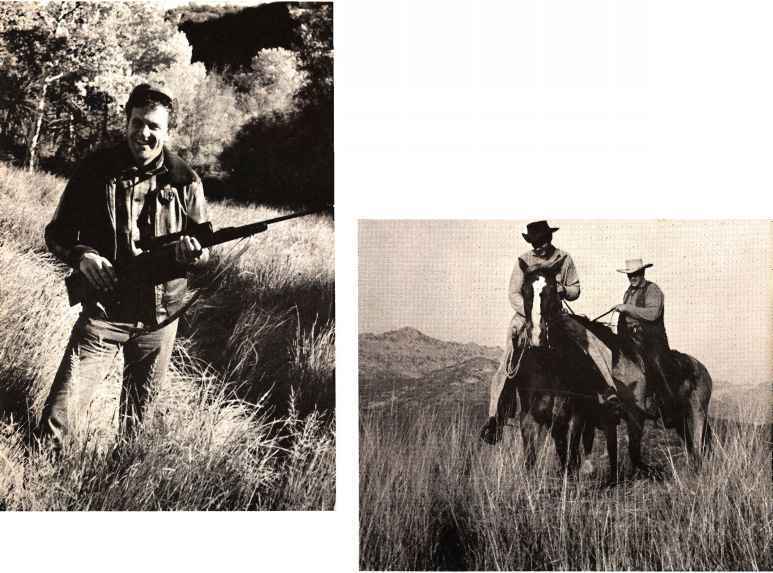 But last fall, when their friend, Charles Bewley, relayed an invitation from Lee Kay (Director of Public Relation for the Utah Fish and Game Department) to come for a deer hunt in the beautiful Pine Valley country of Southern Utah, the "Gunsmoke" cast wired an enthusiastic and unanimous acceptance. Their unanimity was important. Nobody in Hollywood had ever heard of four principals of any company even wanting to vacation together, and when these four demanded time off from the rigors of life in frontier Dodge City, CBS brass had little choice but to grant it. In early November, Marshal Matt Dillon and his pals took off for the Utah mountains. For Big Jim Arness, this was a long-awaited opportunity. Ever since the "Gunsmoke" grind started, Jim had been begging for a big game hunting trip, and this was the first time anybody had listened. Even under a full day's growth of blond beard, the famous Arness grin lit the plane as we flew from Los Angeles to Las Vegas; and when we landed. Jim assumed personal responsibility for loading the guns into our station wagon. The number of guns to he loaded was disproportionate to the number of persons in the party; I began to wonder if there would be room for my cameras! 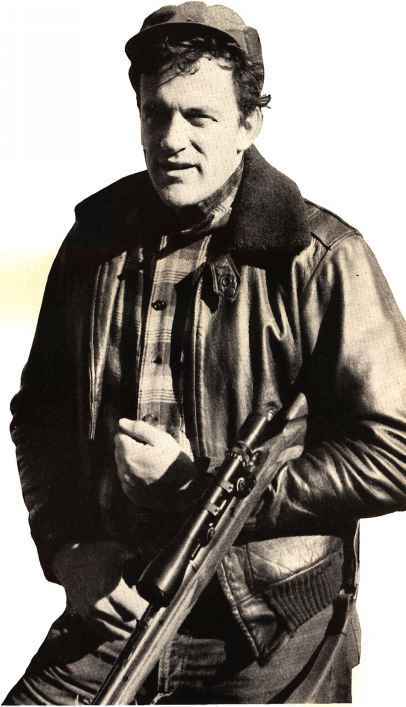 But the ones Jim handled with especially loving care were the two he himself had selected for this journey: a Finnish Sako .270, Mannlicher stocked, given to him by Lew Dillon of Firearms International in Washington, D. C., and a new Remington 725 in .280 caliber, complete with Bausch & Lomb Balvar variable power scope (2^2 to 8X magnification) . From Las Vegas we drove to St. George, Utah, to meet Utah Game Wardens Leavitt and Kay, who led us from there through the extravagantly beautiful hill country to Pine Valley, one of the oldest of Utah's Mormon settlements. Aspens were beginning to turn brilliant yellow under the nip of late fall freezes, and the lush valleys were covered with heavy stands of timothy hay, often chest high to a man. Driving up through Pine Valley into the mountains east of the village, we stopped frequently to check the pastures for sign. Each stop confirmed the promises Leavitt and Kay had made that they would take us into a big game paradise. Deer tracks were as thick here as .cow tracks were around Dodge in the Trail days. Hardly a square foot of the earth in the open and along the streams failed to show vivid evidence of game travel, and we were quite ready to believe the local people who told us, each time we stopped to talk with them, of deer by the hundreds coming down out of the hills each night and early morning to graze the timothy. There was no question here of resentment against "furrin" hunters; these people were glad to see us and wish us luck. That timothy was worth money, and the deer were costly trespassers. "To me, he looked like a big, proud kid standing over his first sling-shooted rabbit." Right, "Chester" and "Mr. Dillon" track two-legged game in scene familiar to TV millions. "Gunsmoke" cast on gunsport vacation. 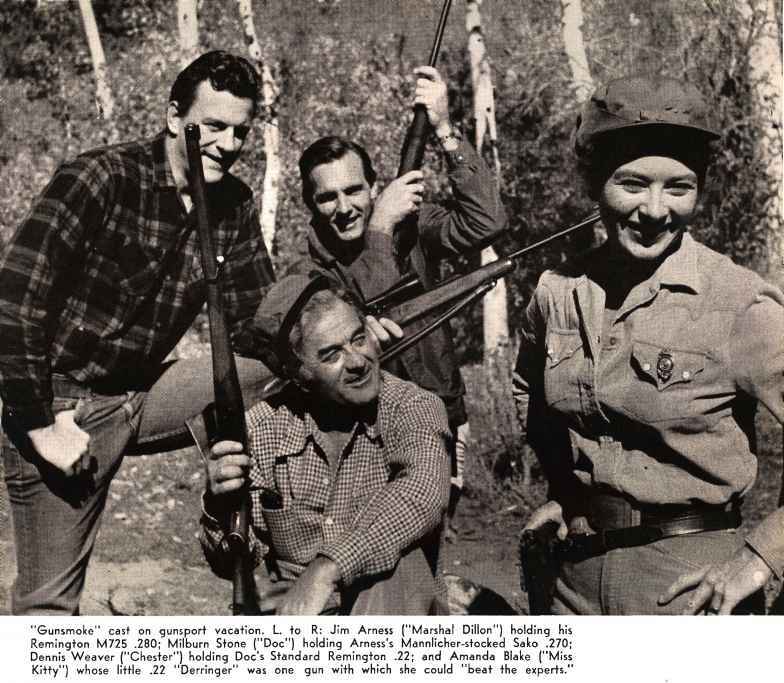 L. to R: Jim Arness ("Marshal Dillon") holding his Remington M725 .280; Milburn Stone ("Doc") holding Arness's Mannlicher-stocked Sako .270; Dennis Weaver ("Chester") holding Doc's Standard Remington .22; and Amanda Blake ("Miss Kitty") whose little .22 "Derringer" was one gun with which she could "beat the experts." hardly conceal his excitement. The wealth of game sign we had seen had lent an edge to a hunting hunger of long standing, and his eyes had a far-away sparkle. But the slow drawl that is so familiar to so many millions might have deceived us. "By golly," he said, "this is livin'. Nice camp; pretty country; a whole week-end of just doin' nothin'." 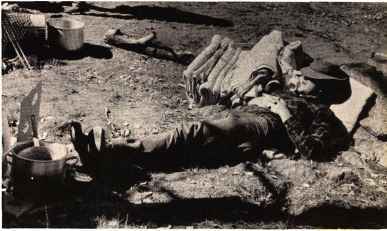 Game Wardens Leavitt and Kay had their own ideas about the meaning of "doing nothing." So did Arness. "We'll be up about three in the morning," Leavitt told us, "and we'll figure to be at the edge of those fields yonder—" pointing up and far yonder—"by sun-up. That's the time and the place for the best hunting, in this country." Big Jim's naps are subject to much ribbing on program, and rocky ground proved no deterrent on Utah vacation. Norma bullets are tested in bench rest outfits such as this heavy Hopkins & Allen U.S.-made Mauser being fired by comely Swedish ballistic lab technician.